Home > Services > Articles & White Papers > “Dilly Dilly!” may be super silly, but don’t expect Bud Light to dilly dally. “Dilly Dilly!” may be super silly, but don’t expect Bud Light to dilly dally. The spots are funny and engaging, and designed to underline the popularity of Bud Light, especially in group settings. (Bud Light is the number-one-selling beer in the U.S.) The spots end with the same copy line, “Here’s to the friends you can always count on. Bud Light, brewed to be America’s favorite light lager.” This closing line is not new to Bud Light commercials; the brand has been using it through a variety of spots in the last year. With “Dilly Dilly,” as a catch phrase, Bud Light appears to have conjured the same viral magic that sibling brand Budweiser discovered with “Wasssup!” in 2000 and the Budweiser frogs (“Bud,” “Weis,” “Er”) in 1995. Both campaigns ended up running for multiple years and dozens of iterations. Goeler sounds a bit like a benevolent king when he says it will be “up to the people to decide” on the campaign’s longevity. Of course, he knows the customer is in charge and he is forthright that the brand fears overstaying the welcome to this concept. “Dilly Dilly!” may or may not have the legs to sustain a run as long as Wassup! or the Budweiser frogs. But leading brands like Bud Light have an insurance policy that smaller brands riding a hit often don’t. Bud Light can afford to develop multiple ad campaigns at once and then ride a winner. Geico has been doing this for years, often running as many three or four themes at once. A copywriter for Budweiser’s longtime agency, D’Arcy-MacManus & Masius in St Louis, once told me that over a two-year period he wrote more than 100 TV commercials that were submitted to the client for review. Of those, they produced only five or six. He said that was considered par for course. Only the very best ideas made it to the screen. And he was one of several writers working on the account exclusively. 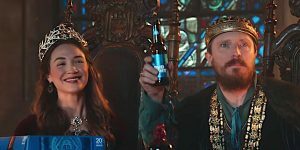 So do expect the “Dilly Dilly!” concept to go for a big laugh in the Super Bowl this year with new material, but don’t expect Bud Light to dilly us to death with their latest hit. They’ll get the most out of it and they’ll resume the search for the next big idea.